Community Homeschool Classes: Will high school literature be too challenging for my student? Will high school literature be too challenging for my student? I recently heard from one of our Community moms who expressed concerns that her student might not be ready for the challenge of high school literature at Community. I was quick to reassure her that this would not be the case! By design, the literature portion of Community's English classes supports students because we are not suffering from any delusions that all students are ecstatic about classic literature! Our job is to make it as palatable as possible. That's why we thoroughly introduce each selection & author, and they are broken down into manageable doses. As one example, Intro to World Lit at Community begins with a gentle summer reading, Then, we hit the ground running with Romeo and Juliet. We read much of it aloud in class which makes for a more fun experience. This year we "hashtagged" the whole play as a form of review each week and our final R&J project was a Twitter convo between 2 characters. They followed that up with an Escape Room activity plus an essay on their favorite character from the play. 9th and 10th grade students genuinely get into it, and all are engaged in class discussions. While every kid will not love every piece of literature, excellent literature doesn't have to be boring. It's rich and tasty, sometimes weird, but it's always thought-provoking. We discuss and compare notes. They are encouraged to express their preferences and particulars. And be challenged. 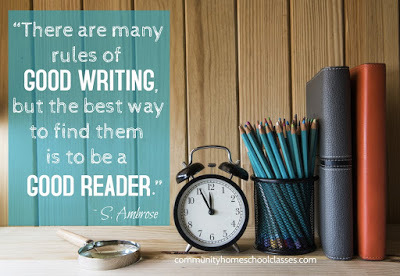 As homeschool parents, we have a fantastic opportunity to guide our kids through fabulous literature. We don't want less for them. We want more! As English tutors, we have a fantastic opportunity to guide our students through a world of new places to meet characters and gain empathy and understanding of them & their stories. Watching them use the tools to articulate all these things is an additionally amazing bonus. Sometimes less is more but, with literature, more critical thinking is the goal! Will classic literature be a challenge for some students? Most definitely. This is actually one goal of exposing them to classics! Will they be thrown into the deep end and left to drown? Definitely not. Community English tutors are intentional about the process of guiding and encouraging. Intro to World Lit also includes extensive writing instruction alongside literature, vocabulary, and grammar review. From Intro to World Lit to American Lit, students will step toward more independence and higher expectations. And they'll be ready! From American Lit to upper-level classes like Brit Lit and Advanced English, they'll continue to be supported and guided while adjusting to a pace that'll prepare them for the next step. For a college-bound student, the ACT Prep in Community's Advanced English is proving invaluable, and student's ACT test scores are improving! If you're considering one of Community's English classes, don't hesitate to contact individual tutors with questions. We're happy to help you figure out a plan for the best place for your student! To find out more about Community's English classes, which include excellent classic literature selections alongside strong composition, visit this page. To learn more about Community's current schedule of class offerings, visit this page along with our convenient online registration. We would love to have your high schooler join us for a challenging and fun year of excellent literature! Follow us on facebook and Twitter for updates on all things Community! Labels: 2018-2019, community, encouragement, high school, High School English, what a difference, Why Community?